PARIS- United States Secretary of State John Kerry hailed Algeria’s leadership in the settlement of Mali crisis, and underlined its efforts that led to the signing of the Peace and Reconciliation Agreement in Mali, by all the involved parties. 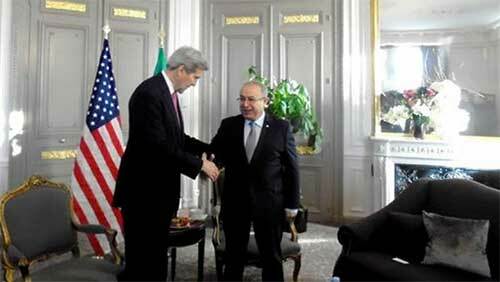 “I would like to hail Algeria’s leadership with respect to the mediation in Mali, where they successfully managed to get an agreement to reduce tensions in Northern Mali,” Kerry told Minister of State, Minister of Foreign Affairs and International Cooperation Ramtane Lamamra, with whom he held discussions in Paris Wednesday morning. The Peace and Reconciliation Agreement in Mali, resulting from Algiers Process, was signed in May and June 2015 following inter-Malian dialogue under the Algeria-led international mediation. Lamamra and Kerry held discussions in the French capital on the sidelines of the UN Climate Change Conference (COP21). The US secretary of State said that they will also talk at length about the crisis in Libya ahead of the meeting that will take place in Rome from Thursday to Sunday in an effort to advance towards an agreement on the formation of a national unity government.